Bulldog 30mm Aluminium Wheel Spacer Set of 4 Lightweight high grade 60601-T6 aluminium spacer. Suitable For: All Land Rover Defenders, Discovery 1 & Range Rover Classic. The more affordable alternative to the Bulldog Hub Centric spacer, this set is made from the same material and to the same highest standards but without the Hub Centric component so we can shave a little off the price for you. Bulldog alloy spacers are not made from steel so you are not adding 25kg to your vehicle this set weigh just under 9kg. These spacers are for Land Rover Discovery 2's and the Range Rover P38. Each wheel spacer is precision made from high quality alloy, high quality and tailored for each specific vehicle. Bulldog hub-centric spacers are supplied with OE Land Rover hub nuts. Please note you will need to use your existing wheel nuts to attach your wheels to the spacer. Lightweight alloy weighing 8KG not 25KG. 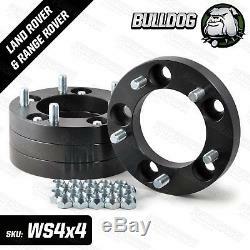 4 x Bulldog 30mm wheel spacers/WS4. 20 x OE Land Rover Hub nuts. Gives clearance for bigger rims and tyres. Please see the image to identify. The HUB type that is not compatible. With over 60,000 customers leaving us feedback you know were a name that you can trust. We aim to achieve 100% customer satisfactions on ALL of our sales no matter how big or small. So if you do have any problems you know well sort it. Please contact our office on for details. Please contact our office to place a telephone order with a credit or debit card. We accept postal orders, sent to our business address. We accept cheques, sent to our business address. Stock All our items are in stock and ready to send from the UK and try and get your order out within 24 hours. Faulty Items All products are individually inspected before being dispatched to ensure items are sent out in perfect condition. We have helper pages on our shopfront for conversion kits and distributors to assist with installation so we encourage you to work through these before contacting us as 80% of issues are resolved when doing so. Please do this before returning any item in order to organise return of the product (preferably in its original condition). This is important and ensures you are happy with our terms. We want your shopping experience to be a happy one and wish to avoid any complications later on. This may sound obvious, but unfortunately this does happen occasionally. Packaging Items are posted in securely wrapped packaging. Feedback We will only leave feedback for you once you have left it for us. Powered by SixBit's eCommerce Solution. The item "Bulldog 30mm Aluminium Land Rover Series Defender Disco RRC Wheel Spacer" is in sale since Thursday, March 22, 2012. This item is in the category "Vehicle Parts & Accessories\Car Wheels, Tyres & Trims\Wheel Spacers". The seller is "simonbbc" and is located in Bromsgrove. This item can be shipped worldwide.